One photograph was once a beautiful castle! It is now a hotel near the street where you enter into Adyah Camp. The tower is Rachaels Tomb, it is walled in Bethlehem, it is not the same wall as the "security wall" but it has the the same structure inside of Bethlehem.There was a family who had a nice home in there, the Israelis told them to leave and they did not pay them anything. 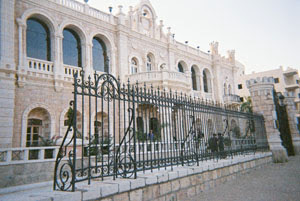 Then they built the wall around the home, so the Jews can visit Rachaels Tomb in safety. 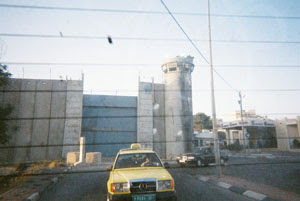 The cars have to drive by it daily coming into Bethlehem or leaving towards the checkpoint. 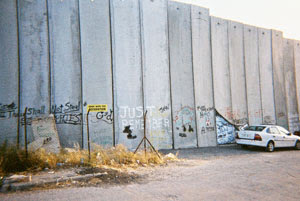 The photograph of the wall, is the view that Adyah Camp gets to see daily. They do not have view of a horizon anymore. The color is drab and ugly. They miss the olive trees on the other side, which used to belong to a local family. The took the olive trees when they built the wall. Families used to go and help with the harvest and eat and walk through the olive trees because there is not any open space in the camp. The children used to play there, because there is not any open space in the camp, nor any green. Now the children do not have a place to play and the people cannot harvest their olives, so they do not have a way of making any money. The children play in the narrow streets on concrete.